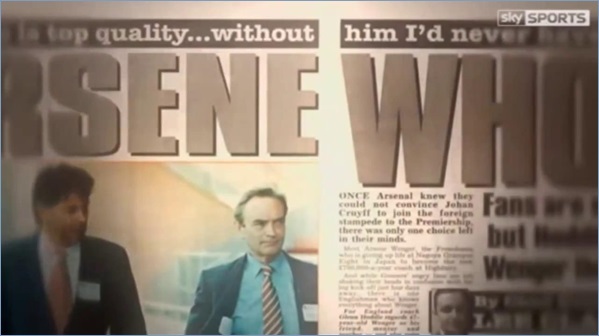 The infamous headline, slathered across the top of the Evening Standard newspaper in September 1996, posed the question everyone was asking then. And maybe still are now. It’s not in Arsene Wenger’s nature to let you in. He’s guarded, studious, un-prone to outward physical remonstrations. He reserves his criticisms for media conferences and the training ground, rarely with any outbursts in between. It’s that hands-off — or laissez faire, if you’re culturally inclined — approach that changed both Arsenal and the Premier League forever, and also perhaps led to his announcement Friday that after 22 years on one of club soccer’s hottest seats, Wenger would be stepping down as Arsenal manager. Gallons of ink have been spilled on Wenger’s failures over the past decade-plus of his time with the Gunners. Sure, he’s won the FA Cup three times in the past five seasons, but that dinosauric competition has papered over, however thinly, the cracks in a tenure that has been unraveling for awhile now. But Wenger was never the type to interfere in stuff like that. The way he sees it, it’s not his place. He was never supposed to be here. Whether “here” means the Arsenal job, or a career in soccer (his family initially wanted him to take over their spare parts business in France), or doing things nobody had done in the English top flight for over a century, it didn’t matter. Rather, Wenger let his players figure things out for themselves. Oh he’d instruct them in training, and amend the tactics, and pour over film, to be sure. (You don’t earn the nickname “Le Professeur” without that ethos.) But it was always up to others. YOU have to figure out where to go from here. Similar to how Phil Jackson would infamously refrain from calling timeouts during rough stretches for his Bulls and Lakers, Wenger left it up to you to decide how you’re going to get out of this. For years, it seems the Arsenal brass struggled with just that. How do you sack a manager whose best days are clearly behind him, but whose best days are also better than arguably anyone who’s ever managed in England? No matter how vocal or vitriolic the fans are about it? That makes perfect sense, and given the manager in question, it also makes no sense. Arsene Wenger? Leaving on his own accord? The only thing he loves more than soccer is perhaps the process of loving soccer. You’d have to drag him out of the Emirates, or so we thought. After all, he basically built the place. For all the old Highbury stadium’s intimate, filthy charm, Wenger’s success over his first decade kickstarted a movement (both literally and figuratively) to greener pastures. The Emirates Stadium is a first-class facility in every respect, with a billiards-smooth pitch, nearly 60,000 seats and enough luxury suites to host every A-lister in the world. Wenger won the Premier League his second season in charge, then won it again four years later, then put together what the BBC voted as the greatest team of the EPL era, an “Invincibles” side in 2003-04 that went an entire 38-game schedule unbeaten. Wenger himself said that was his greatest achievement, but there were plenty others, including seven FA Cup triumphs and a Champions League final berth in 2006, the first ever for a London club. Forged by frugality and failure at AS Nancy in the mid-1980s, Wenger nevertheless learned what it takes to steer success. He won Ligue 1 as Monaco manager in 1988, and also had measured accomplishment in Japan with Nagoya Grampus, where he spent the two years prior to his arrival at Arsenal. And you know what? Forget the trophies for a second. Wenger’s chief influence is probably off the pitch. He was the first Arsenal manager from outside the British Isles, one of the first non-British managers in the English top flight period, and a sycophant for both nutrition and nuance. “What does this Frenchman know about football?” former Arsenal captain Tony Adams infamously quipped. “He wears glasses and looks more like a schoolteacher.” Well, that schoolteacher taught his players new ways to diet, new ways to train, new ways to play, and new ways to earn results. As a player, Wenger was never the fastest, nor the strongest. He made the most out of himself, and he sought to do the same with the teams he managed. He didn’t want to buy stars. He wanted to buy projects, like Patrick Vieira and Thierry Henry, who he helped mold into two of the greatest Gunners ever. His rise coincided with the rise of French football on the whole, with the turn of the century giving way to silverware at both World Cup ’98 and Euro 2000, which provided him stalwarts like Emmanuel Petit, Robert Pires, Sylvain Wiltord and Nicolas Anelka. Those wells have since dried, with Wenger becoming a victim of his own success. Nowadays, most of the major clubs emphasize nutrition and more open play. They have access to players from every nook of the planet in the transfer market and their academies. Wenger outed the secret to success, and everyone followed. He couldn’t really adapt once that happened. Wenger isn’t a fear monger. His bluster is directed at the opponents, the referees, the media, but rarely at his own players. He was the right man to bring Arsenal into the 21st century, and the wrong man to keep it there. A disciple of Johan Cruyff’s revolutionary “Total Football” methodology, Wenger’s imprint could only extend so far. He set his teams up to play to their strengths, not prey on the opposition’s. Once his own sides’ strengths became questionable, he never really found the answer. That doesn’t erase his legacy. He made the Champions League every year for two decades straight. He positioned Arsenal as the first true challenger to Manchester United’s Premier League supremacy. He fielded teams with such flair you could hang several of their goals in the Louvre. That’s who Arsene Wenger is. Or was. How will you remember him? You’re the player now, confronted by Wenger’s frustratingly paradoxical resume. You’re in the midst of it, now that he’s announced his retirement. You get to define his legacy.